Missing Person: Annie Cody, 79, BF, 5'4", 85 lbs. 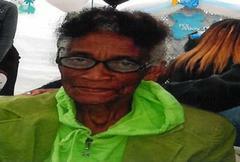 Last seen on 2/2 on Asbury Ave, Asbury Park, N.J.
Annie Cody, 79, black female, 5'04", 85 pounds, short black hair with grey on the sides. She was last seen on February 2, on Asbury Avenue, Asbury Park, N.J., wearing glasses, a pink shirt, blue jeans, black coat, and white sneakers. She was on foot using a walker at the time, but may be using public transportation. If you have information that can assist in helping safely locate Annie Cody, please call 911 or contact the New Jersey State Police Missing Persons Unit at (609) 882-2000 ext. 2893 or Asbury Park Police Department at (732) 502-4534.